At Absolute Ecology our ecologists have experience in undertaking detailed site-specific badger surveys such as scoping, camera trapping and bait marking. Badgers and their setts are protected, mainly to prevent persecution rather than for conservation reasons. 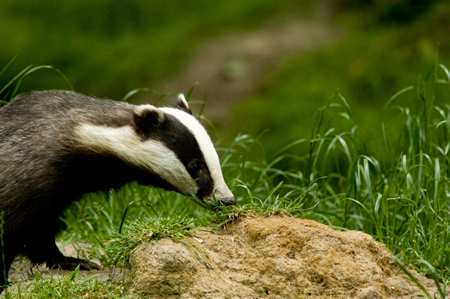 At Absolute Ecology we are experienced at providing a solution for the mitigation & licensing of badgers. A licence can then be obtained from Natural England to permit disturbance or destruction, and we will guide you through the timing constraints. The badger scoping survey can be done all year round – setts are easiest to identify during the winter & spring when vegetation has died back. This technique involves determining the territories of badger social groups. The bait is a mixture of peanuts, golden syrup and indigestible plastic pellets (which is harmless to the badgers), and this is placed close to badger setts. The plastic pellets placed at each sett are a different colour that can then be identified through the badger’s droppings. Badgers mark their territory with communal latrines (dung pits); therefore the coloured pellets recorded within dung pits can be used to form an understanding of the extent of a badger clan’s territory. The information from bait marking can then be used in conjunction with recording other badger activity such as well worn paths and footprints. The badger bait marking can be conducted from February to April. Badger setts or potential setts can also be monitored using infra-red motion-activated cameras which are positioned overlooking holes and left for a number of nights. Any motion around the hole will trigger the camera and activity will be recorded as this may provide information on how the badger sett is functioning by the badger as this will aid in terms of licencing and mitigation. Alongside this, hair traps (sticks with adhesive tape attached) can be placed within the hole so that any mammal entering / exiting the hole will dislodge the sticks and leave a hair sample. Badger sett surveys (camera trapping) can be conducted September to November & February to April. Badgers are protected by a number of laws. Badgers may not be deliberately killed, persecuted or trapped except under licence. Badger baiting (using dogs to fight a badger) has been outlawed since 1835, and digging for them was made illegal by the Badgers Act 1973.